The landmarks came thick and fast in the first half too. That meant it was the fourth successive knockout game that Croatia had conceded first but Perisic, who got the equalizer against England, was on hand again to level the scores 10 minutes later, smashing in a low shot after Sime Vrsaljko had headed Luka Modric’s free kick across the box. 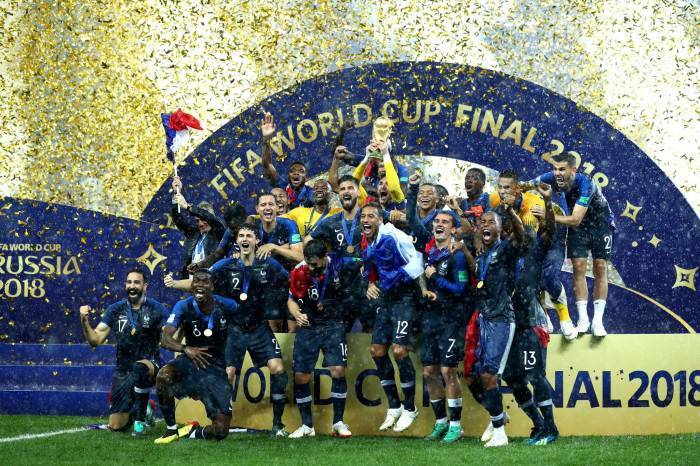 But France’s defense, so impressive all tournament, held and they went 3-1 up on the hour as Mbappe and Griezmann combined to set up Pogba on the edge of the box. His right-footed shot was blocked but he coolly curved the rebound in with his left. After three successive extra-time knockout games the chances of another Croatian comeback seemed slight but they looked dead and buried six minutes later. Lucas Hernandez tore down the left to set up Mbappe who drilled a low shot beyond keeper Danijel Subasic for the 19-year-old’s fourth goal of the tournament.